Phosphors are efficient light emitters but they’re not optimal for high-speed communications because they turn on and off slowly. Researchers from Brown and Harvard have now found a way to modulate light from phosphor emitters orders of magnitude faster using phase-change materials, which could make phosphors useful in a range of new optoelectronic applications. PROVIDENCE, R.I. [Brown University] — Researchers from Brown University, in collaboration with colleagues from Harvard, have developed a new way to control light from phosphorescent emitters at very high speeds. The technique provides a new approach to modulation that could be useful in all kinds of silicon-based nanoscale devices, including computer chips and other optoelectronic components. Phosphors are common light emitters used in light bulbs, LEDs and elsewhere. They are extremely efficient because much of the energy pumped into them is converted to light as opposed to heat. But they have a slow optical lifetime, meaning it takes a relatively long time for them to return to the ground state after being excited. As a result, phosphors can’t be turned on and off very quickly. Glow-in-the-dark toys, for example, take advantage of this property. 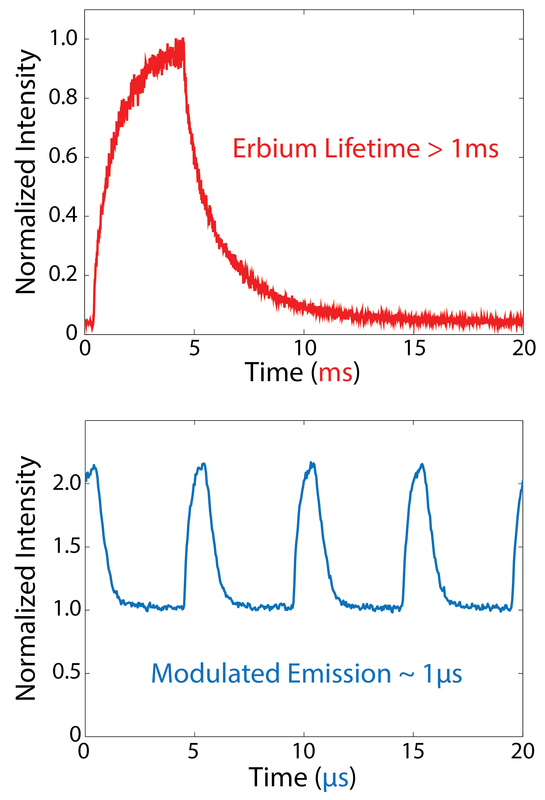 But in this latest work, Zia and collaborators, including researchers from Shriram Ramanathan’s group at Harvard University, took a different approach to modulation. “Instead of changing how much light is coming out, which can only be done slowly in phosphor emitters, we came up with a system that changes another quality of that light, namely the color or spectrum of light emission, by rapidly changing the environment around the emitter,” Zia said. The work was led by Sébastien Cueff, a postdoctoral researcher in Zia’s lab. Cueff started with an emitter made of erbium ions, an important phosphor that is widely used in fiber-optic telecommunication networks. He combined that with a material called vanadium dioxide (VO2). VO2 is a phase-change material that, when pumped with energy, changes very quickly from a transparent insulating state to a reflective metallic state. This change in reflectivity, in turn, switches how nearby erbium ions emit light. As the VO2 changes phase, the erbium emissions go from being generated mostly by magnetic dipole transitions (the rotational torque push and pull of magnetic forces), to being generated mostly by electric dipole transitions (the linear push and pull of electric forces). Those two emission pathways have distinct spectra, and the modulation back and forth between the two can be used as a means to encode information. Experimental data comparing traditional lifetime (top) with new modulation approach (below). While the curves may look similar, the time scales are very different. The lifetime curve is plotted in milliseconds, whereas the observed modulation is plotted in microseconds (one thousand times faster than the lifetime). Prototype on-chip networks have used semiconductor lasers as light emitters. They can modulate very quickly, but they have downsides. Semiconductors can’t be grown directly on a silicon chip, so fabrication can be difficult. Using indirect means of modulation — interferometers, for example — makes for bulky systems that take up a lot of real estate on a chip. What’s more, semiconductor lasers are not particularly efficient. They produce a lot of heat along with light, which is a problem on a silicon chip. Erbium and other phosphors, on the other hand, can be deposited directly on silicon, making fabrication easier. And phosphors are highly efficient, so heat is less of a concern. There’s still more work to be done to get such a system up to a speed that would be useful on a chip, but Zia and his colleagues think it’s possible. In this initial experiment, the researchers used a laser to zap the VO2 and cause it to change phase. A faster means of changing the VO2 phase — perhaps using electricity instead of a laser — could make the system much faster still. Zia and his group plan to continue to refine the technique, but they describe this first set of experiments as an important proof of concept. “We ... hope that the device and concept presented here will engage both academic and industrial researchers working on optoelectronics and nanophotonics,” the researchers write.